1995 letter by Donald Bucklin, regarding FBI warning on the contract on my life. 1995 A December 4, 1995 teletype message of U.S. Legal Attach? (LEGAT) in Moscow to the FBI Director. The document states that Russian officials were hectoring the FBI about my extradition at every opportunity: "On several occasions this matter has been raised as one of the most important cases referred to the FBI." Furthermore, when the FBI "requests assistance from the procurate, … this matter is brought up as an example of bureaucratic and legal obstacles the Russian and American sides encounter in filling requests. … [the Russian side] is still treating the liaison process on a quid pro quo basis. … In the absence of an extradition law [i.e., a treaty with Russia], are there any immigration violations outstanding allowing immigration authorities to deport Konanykhine to Russia to stand trial for the aforementioned embezzlement?" When the INS could not find any problems with my immigration status, they simply fabricated them. Pages: one, two, three, four. 1996 This Declaration of Nikolai Mentchoukov resulted in KGB destroying his business and assassination attempt of brother-in-law. 1997. One of many pages of legal motions I filed from my jail cell, when I was not able to afford an attorney. 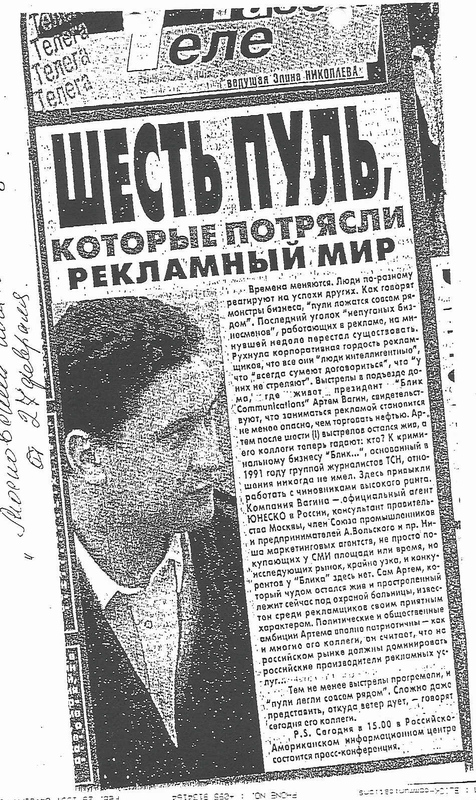 1993 Kommersant report on investigation related to assault of the KGB group which hijacked my businesses on my former deputy and kidnapping of his brother. 1993 One of my articles on criminalization of Russia. 1993 A newspaper report on the first anniversary of my forced immigration from Russia. 1997 “Six Bullets Which Rocked Advertising World” and “The Assassin Shot..” articles in a Russian newspaper, on attempt to assassinate Nikolai Mentchoukov’s brother-in-law of.